TRUTHOUT–For the first time in the history of Brazil, the federal government is investigating the deaths and abuses suffered by Indigenous peoples during military dictatorship (1964-1985). The death toll may be twenty times more than previously known. Just as in World War II and Vietnam, napalm manufactured in the US burned the bodies of hundreds of indigenous individuals in Brazil, people without an army and without weapons. The objective was to take over their lands. Indigenous peoples in this country suffered the most from the atrocities committed during the military dictatorship (1964-1985) – with the support of the United States. For the first time in Brazil’s history, the National Truth Commission, created by the federal government in 2012 in order to investigate political crimes committed by the State during the military dictatorship, gives statistics showing that the number of indigenous individuals killed could be 20 times greater than was previously officially registered by leftist militants. Unlike other crimes committed by the State during that time period, no reparations or indemnification for the acts have been offered to indigenous people; they were not even considered victims of the military regime. “From the north to the south and from the east to the west, accusations of genocide, assassination of leaders and indigenous rights defenders, slavery, massacres, poisonings in small towns, forced displacement, secret prisons for indigenous people, the bombing of towns, torture, and denigrating treatment were registered [with the State Truth Commissions],” Marcelo Zelic, vice president of the anti-torture group Never Again – SP, one of the organizations that makes up the Indigenous Truth and Justice Commission, created in order to provide documents and information to the National Truth Commission – told Truthout during an audience with the Truth Commission of San Pablo open to journalists. Free Thinker Radio (1/7/19): The Government Would Never Lie To You! 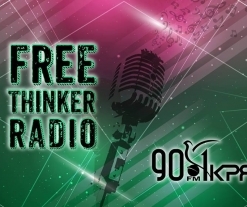 Free Thinker Radio Joins 90.1 FM in Houston Starting January 2019!